Join the electronic age with JeppView electronic navigation charts. Receive all the information you get from our standard Airway Manual and VFR Manual in easy-to-use electronic format. Save money, time and paper and help protect the environment. You pick the coverage area and we’ll supply airway and airport diagrams, navigation aids and approach plates - all electronically. Say goodbye to the days of carrying paper and cluttering your cockpit. 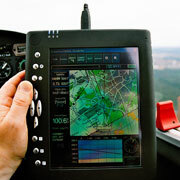 Use electronic charts for flight preparation on the ground and in-flight with a mobile device in the cockpit. To learn more, please visit our Mobile FliteDeck page.